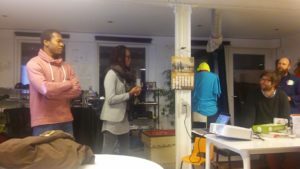 Recently i attended the “BAC21: Energy and Open Hardware”-Workshop” in Brussels, from 11.11. until 13.11.2016. Here is my report about that.. The POC21 was a so far unique event, but it was also a departure that provided a seed, which now starts sprouting. 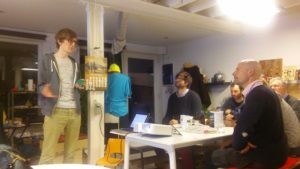 Therefore the BAC21-Workshop can be seen as a kind of follow-up event, where some of the POC21-attendees and their projects participated, amongst other persons like me and some OpenHardware-protagonists and engineers from the local Brussels FabLab- and university-environment. Also the event was financed through funds from a POC21-budget. 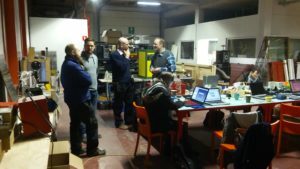 For using the small time period of the workshop in a most effective manner, the focus was set a priori on OpenHardware-Eneergy-projects. 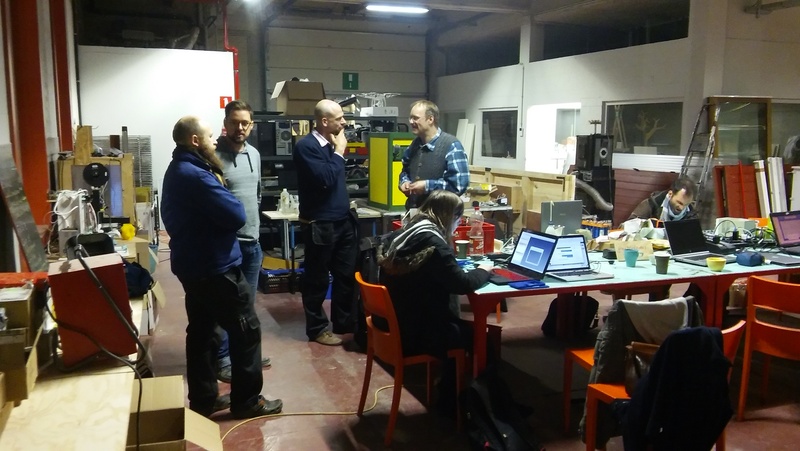 Some of the POC21-projects and other sustainable Openhardware-projects have more or less directly something to do with collecting and storage of energy, so we tried to identify the common elements and formulate strategic targets for their common needs. This should lead us to an approach with especially one thing in mind: A cross-border collaboration, which bundels the menpower and skills of the individual teams in an optimal way. So, as one important part of the workshop, we tried to create a theoretical framework and to define some common basics and standards, eg. which kind of connectors and plugs are suitable for our needs. The attendees brought several appropriate products with them, which now became analyzed and compared in terms of their performance (how many amperes), aspects of safety, functionality (hot-pluggable), availability and price. Apart from such detailed questions we discussed also a superordinate concept with the working titel “Open Source Energy Mesh”. 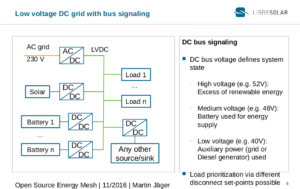 This refers to the idea of a decentral and intelligent lowvoltage-DC-grid, which should be specifically dedicated, developed and optimized for the combination with renewable energies. A similar proposal already was suggested 3 years ago by Alex Shure at OpenSourceEcology Germany (project “DiVER“). He recently reworked and refined this and gave it the new name “Open NanoGrid.“. An approach that even goes beyond that was presented at the BAC21 by Martin from LibreSolar. 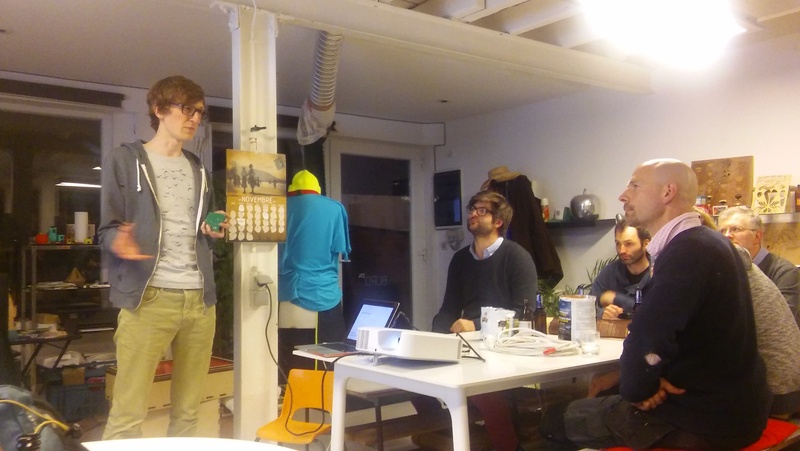 He introduced us into some possible variants of OpenSource-EnergyMesh-topologies and compared their pro’s and con’s. Afterwards the group was able to work out, which version is favourized as best suited common standard. 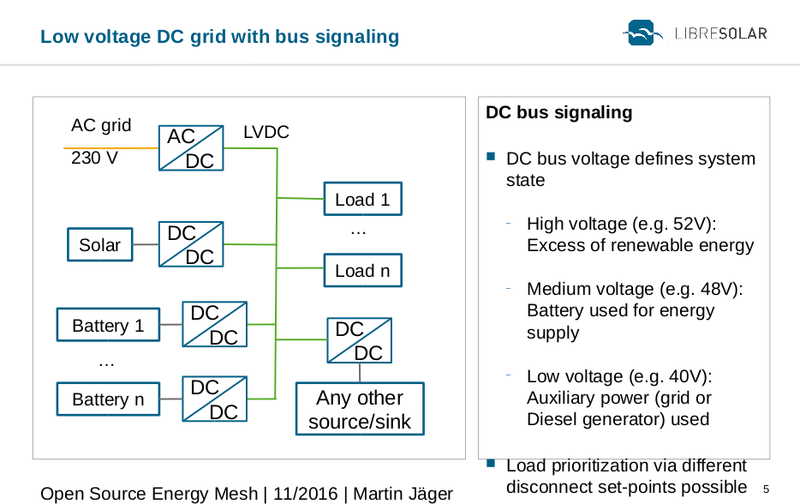 This turned out to be a so called “Signal-Bus-topology”, that is characterized by combining the sources (Akku, PV) with a DC/DC-converter to reveal an independency towards different voltage levels, so that the grid offers a unique Voltage-level in a range about 48V. Since it should be an intelligent grid, the sources as well as the consumers must be enabled for decentral communications, to provide an intelligent Load-Balance-management and priorization. So we evaluated some different data-transfer-protocols and bus-systems and agreed in the end on the CAN-bus, which offers high data-transfer-rates and most sturdy robustness (it is therefore often used within automotive electronics). 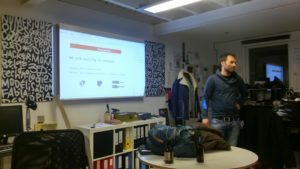 At the beginning of the event all the projects were presented, so we got an overview on their recent development-status. I (Oliver) had my Zinc-Air-cell and the Solarbox with me and a new, smaller SolarBox-version which i had quickly assembled in the days before the event. New Solarbox-prototype with UniProKit Housing. Also there were the projects Velo M^2 (Florent, Tom, Yannick), Sunzilla (Laurin) and LibreSolar (Martin). If you consider all these projects in total, you will recognize the common need for an OpenHardware-Charge-Controller with integrated balancing (BMS) for Lithium-batteries. This is also needed within the OpenEnergy NanoGrid for a safe use of such batteries. 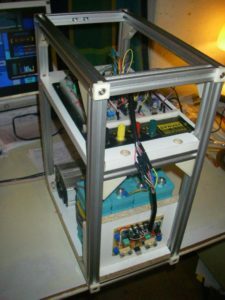 So its a good point to start with and thats exactly what Martin is doing by the LibreSolar-project, which aims to develop a 48V BMS. 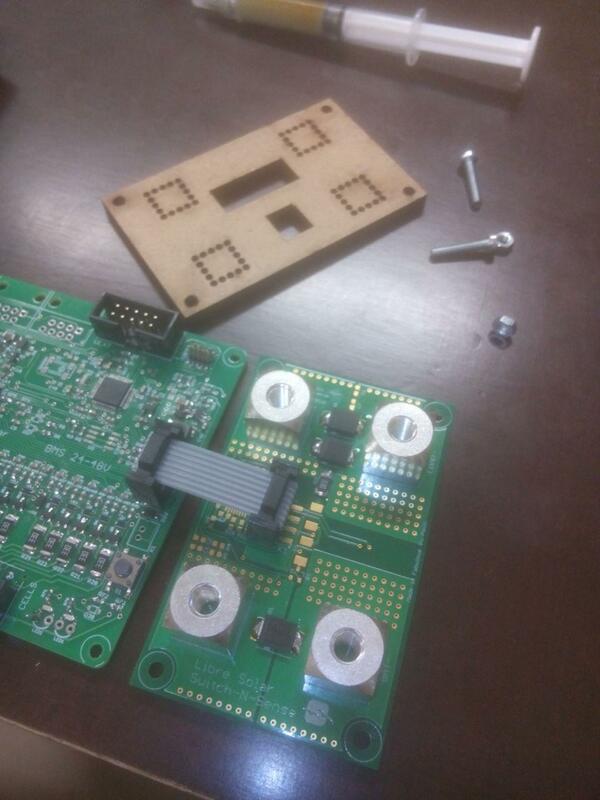 He showed us the first pcb-prototypes, fresh from the forge but already up-and-running. Its a modular system, consisting of a balancer-board which is based on a STM32F072 32-bit MCU with a BQ67940-balancerchip and an integrated CAN-interface, plus a separate power-module, that allows the charging and discharging being controled by N-Channel-MOSFETs in high-side-configuration. This charge-controller is comparable to the SBMS4080, which i use in the SolarBox, but offers the additional advantage of being able to handle 48V. 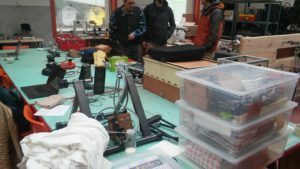 The BAC21 took place on different locations, so we had the chance to become acquainted with different FabLabs in Brussels, including the Velo M^2, which also can be used as kind of mobile micro-FabLab. The event started on Friday at the OpenFab, one of the first FabLabs in Brussels. 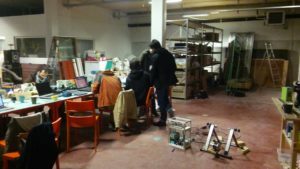 The OpeFab is maintained by Nicolas and Xavier and offers a cozy atmosphere and a rich FabLab-typical equipment. Here the projects were introduced followed by an entry into the theoretical part of the course. On Saturday we continued with a more practical part by working on some detailed challenges of the projects. Therefore we went to the Micro-Factory by Gilles and Rupert, which offers a 800sqm area, containing enough space to include a large and well equiped woodworking compartment and another one for metal-works with big power-tools. The entry-compartment is a multi-purpose-area for electronics- and 3d-printing works. Of course the time was to short (as usual ;)) to fullfill all the tasks we had on our agenda, but that doesnt matter. 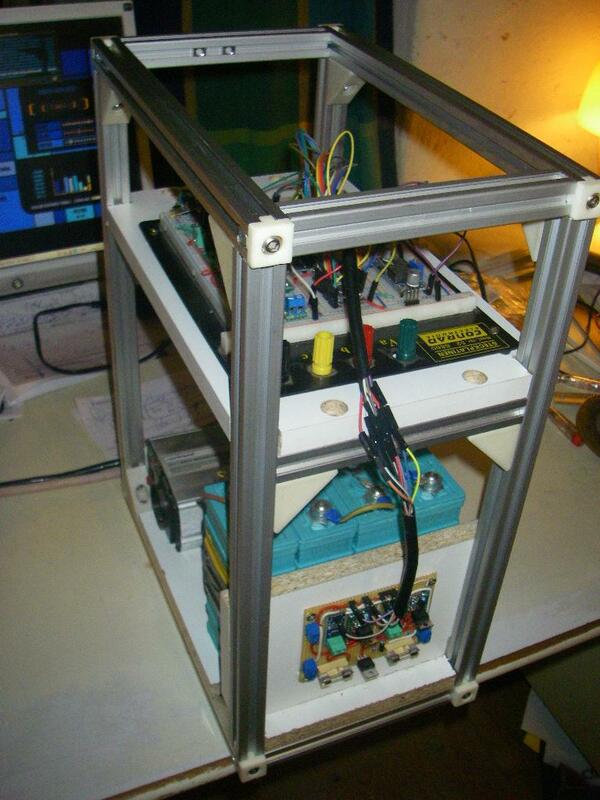 Some work was done at the DC-converter of the generator-module of the Velo M^2. It is part of a fixture which allows to clamp a bicycle into it and then producing electric energy by pedaling. A well-trained bicylist to generate more than 100 Watts. This doesnt seem to be that much at the first view, but makes in fact sense in mobile applications, e.g., you can drive a little openair-cinema with it. 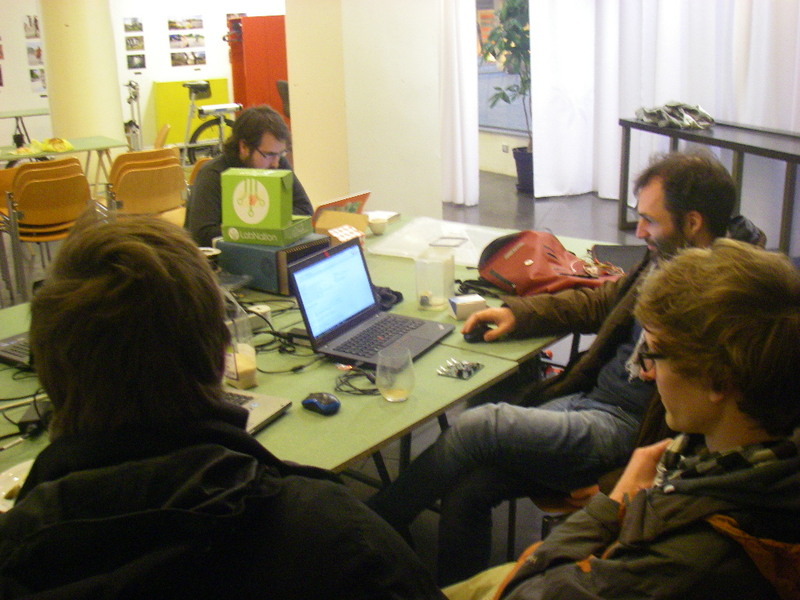 On Sunday a meeting happened at Hackistan, in the Galeria Ravenstein. 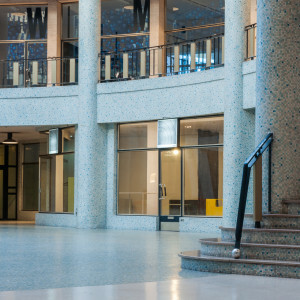 Its an architectonically impressive building with a shopping-mall-passage that leads to a multi-storey rotunda with a light dome, with a fassade in sandstone and marble optics. Hackistan is a group with wide-spreaded networks and a broad range of projects, with ecological sustainability as a common denominator, similar to OpenSourceEcology. 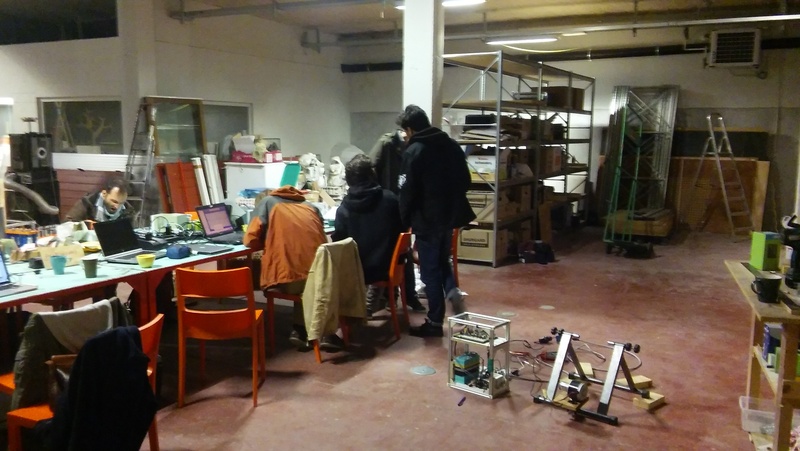 Their location in the Galeria Ravenstein is not a conventional FabLab, but the rooms can be used also as showroom and for presentations and classes. But with joining some tables one can create a bigger working area which is appropriate for smaller works, like our electronics workshop. The last hours were extensively used, to extend and refine the theoretical part so we ended up with the good feeling of having made a great step forward and created good conditions for the upcoming cross-border collaborations. A further meeting is planned for the next springtime. Finally, i want to say thanks and much kudos towards Yannick, for putting great efforts and work into organizing the whole event. Yannick is a kind of sovereign force and a calming pole in the background, which unites all the strings and loose ends and has been taken care for the whole schedule and flow of the BAC21 was running well and fine balanced. Beside all the technical lessons there was also a little cultural programm for us, like visiting the top-notch scene-pubs and bistros, underlined by interesting info about the Brussels city itself and especially about the local FabLab- and OpenHardware-scene.